Another week, another wrap-up! This week was quieter than the last few weeks, but it was no less exciting. From starting a morning and afternoon workout routine to finalizing the GiveBack DC website, we managed to stay fairly busy. Also, it’s March 1st which means spring is only 20 days away! Last week we launched this year’s GiveBack DC website. This week we revamped it to better fit the needs of the target audiences. The site is custom designed and developed on WordPress. If you are interested in learning more about how we give back to the community, check out the website! Be sure to apply now! Do you want to look as good as our WordPress Developer, Kyle? Well, you can! 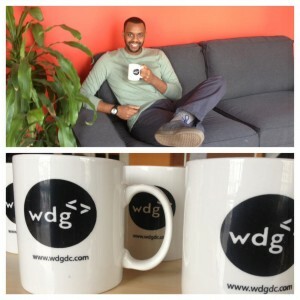 We received some coffee mugs that have the WDG logo and URL printed on the side. If you find yourself in Old Town and are interested in grabbing some coffee, stop on by! Even if you aren’t an NFL player, our doors are always open. Can’t make coffee? What about AM Insanity? Quite a few of our team members have starting doing morning and afternoon sessions of Insanity, the award winning workout routine. Like everything at WDG, when we commit to something, we go all out. Meeting at 7:30 AM at the park near the office is tough, but the workout energizes us and helps push through the day’s projects. How else would be able to have so many awesome launches? As always, thanks for taking an interest in our WordPress and Drupal website designs. We are always open to talking more about how we can help you build a better online presence. If you like our Friday office wrap-ups, be sure to follow us on other platforms as well!